N was running in the Ragnar Relay this weekend. 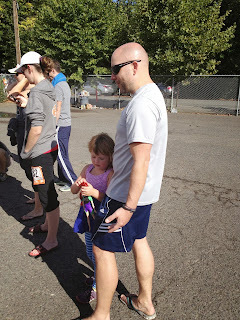 When it became apparent he planned to stay to cross the finish line with his team (last relay he was sound asleep by the time his team finished) Molly and I got ready to drive up there to cheer him on. Unfortunately we hit the rain storm N had been running in on the drive up. By the time we got to the Russian River Brewing Company everybody was getting ready to head out. Luckily they had already secured some Pliny to go. We drove through the hills to Calistoga where the finish line was. The sun had come out at this point and it was a gorgeous day. Molly was able to run across the finish line with the team (see video clip below). However, I think her favorite part was being allowed to draw on the white van with markers. N passed out pretty much immediately and Molly dozed off about halfway home. There was some race traffic to deal with, but it was a lovely drive through Napa Valley. Driving 230 miles in one day was not exactly how I thought I was going to spend my Saturday, but I think it was worth it. I get to draw ON the van? OK!! !